“Saawariya” is the first Bollywood (the name all musical movies made in India are referred) movie produced by a Hollywood production house. “Saawariya” is based on Fyodor Dostoevsky’s short story, White Nights. Ranbir Kapoor (Rishi Kapoor’s son) and Sonam Kapoor (Anil Kapoor’s daughter) star. “Saawariya” also stars Salman Khan and Rani Mukerji in supporting roles. 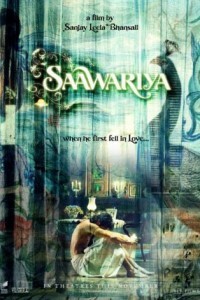 “Saawariya” tells the story of a 22 year old man who is a dreamer. He comes across a young lady and their story begins. Days are as bright as night. The story takes place during four nights that the lovers spend together. It is the tale of a shy dreamer, Raj, who spent most of his time isolated in his apartment, creating riddles and finding answers to them, jabbering poetry or arguing with his foolish landlady Miss Disa, with whom he shared a love/hate relationship. Raj was loved by one and all, for he always brought happiness to the people around him. Destiny plans a magical tale for Raj over the next four nights of his life that shall change his entire being.